theFishy wrote: I have the address saved to my favorites list, but Xanadu doesn't show up on the server list for me. Its address changed to 98.166.127.241. You should always check https://servers.minetest.net/ if you have problems after the server has been down for a while. @auouymous, ahh, okay. That makes more sense now. Thanks! TenPlus1 wrote: The server router was reset, look for Xanadu on the server list as it probably uses a different IP now, connecting to your current *favourite* on the list wont work. this mean we will begin from 0 ..... ? xanadu will return to a new place without houses and any thing ????? No, it just changed the IP address, not the server's map, everything should be just fine. That right there is one of my biggest beefs with minetest as it stands currently. https://servers.minetest.net loads light-years faster than the server list within minetest *usually*. Hi guys, I came back from a long break, what has changed? Btw, All my chests were removed from the IronFish hotel, can you return my pads that are still there? Miguu wrote: Hi guys, I came back from a long break, what has changed? fishy's protections got cleared from inactivity, so most likely some curious house raiders took your chests. Welcome back Miguu. :) I think your telepads are still in the hotel, and so I can return them, but as for your chests, I don't know what happened to those. You might ask the player wwar, if you see him on Xanadu, as he was the one who had the hotel protected while I was away. Hope to see you in-game soon. theFishy wrote: Welcome back Miguu. :) I think your telepads are still in the hotel, and so I can return them, but as for your chests, I don't know what happened to those. You might ask the player wwar, if you see him on Xanadu, as he was the one who had the hotel protected while I was away. TenPlus1 wrote: If a player has been away for over 6 months and they have built something wonderful then I or another player will take that build over and keep it protected. We try not to remove anything that brings something special to the server. That is not enough. It is ok if an unfinished building or something unfinished into which obviously was not too much work invested gets removed or moved to a diffrent place if the development of the region requires it. But just to take areas away and give them to other players just because the original owner didn't show up for some time is not acceptable behaviour. Ownership of the area is an indicator of who built it. If you change that you're effectively lying. It's like if I'd claim to be the creator of mobs_redo (which I'm obviously not), you'd claim to be the creator of the Minetest engine (which you are not), or if the people owning an arts museum claimed they'd painted all these old masterpieces because they hadn't seen the original creators in a while (probably dead due to time having passed). It's a differend thing if a new owner gets added in order to maintain shops or keep connections to the roads working. Even careful alterations to the buildings themshelves may be justified. However, the newly added owner always needs to act in the best intrest of the original creator. This does not apply to mere cobble boxes or anything where creativity wasn't in effect. In all other situations: The added owner becomes maintainer - not creator. Now I'll never be able to walk over Xanandus landscape again and praise people for what they've created - because there may be false claims. Having to fear that my buildings will eventually be truely stolen by someone wrongly claiming officially to having created them, and in a place where creators are valued so little, I ask for help to tear my buildings on Xanandu down. It might break my heart to cut them all down and require quite a lot of time but I feel that it is necessary. Our values are just too diffrent. I understand your point Sokomine. But if you do not get on the server for over 6 months, I don't see that it is entirely unreasonable to free up those areas for others to maintain or use. Kilarin wrote: I understand your point Sokomine. But if you do not get on the server for over 6 months, I don't see that it is entirely unreasonable to free up those areas for others to maintain or use. Unused areas of course ought to be passed on after a while. Using...is a bit tricky if they *are* already used by a building standing on them. There's a lot of free room on each map. Thus, giving used areas over to others is IMHO a blantand disregard of what others created. Sokomine wrote: Thus, giving used areas over to others is IMHO a blantand disregard of what others created. Depends on where it is. If it is out in the boonies, then sure, Why bother giving it to someone else. BUT, if someone is possessing an important piece of property near spawn or in a major town, I can certainly see passing it on. And ESPECIALLY if it is a publicly used area that needs to be maintained. I think you are viewing the server as a work of art, to be explored and enjoyed. And from that perspective, changing the ownership on any construction is tantamount to changing the signature on a painting. And that is an entirely VALID point of view, and one which I come close to sharing. But that is not the only way the Xanadu server is used. It is also seen as a community. Much like a real country. And if a building in a community is abandoned, that property becomes a gap in the economy. This is ALSO a valid point of view. And, in some circumstances, I subscribe to it. I'll give you two examples. Suppose there was a gorgeous castle built on a mount top off of a major trail. The builder abandoned it a long time ago, but so what? It's just there to be seen and enjoyed. I see no disadvantage to just leaving the ownership of the castle as is. BUT, suppose the same builder built a large and beautiful shop right off of main street near spawn. But now, when a new player wanders in, they find the shop is abandoned, there is nothing to buy or sell, and their first impression is that this server isn't very "lived in." It makes perfect sense to me to go ahead and change the ownership on that shop so that someone who is active and will be maintaining it (or even replacing it) can use that important space. That's my opinion. But of course, Xanadu is a privately owned server, we are guests, and the owner has the right to distribute property as they wish. I got a bit more built. I and probably many others build just for fun, not for recognition, and building on servers provides motivation to finish and helpful suggestions from others, where as singleplayer doesn't. I'd rather see my builds claimed by someone else than see them slowly decay as new players grief the unclaimed areas or know a server command was used to erase my build from existance. And many builds you praise the owner for might have been built by more than one player. I've contributed to other player's builds and so have many others. And how many players have built really nice homes and given them to new players as gifts? The world will always be full of liars who take credit for other's work, but if you ask many players who re-claim a build, they'll probably tell you they aren't the original owner. That is awesome looking Binshaden! Kilarin wrote: I think you are viewing the server as a work of art, to be explored and enjoyed. And from that perspective, changing the ownership on any construction is tantamount to changing the signature on a painting. That's right. There are other ways to enjoy the game from time to time - nothing wrong with a bit of mining, mob interaction, lucky stairs arena or just the friendly chat with other players (which is valuable in itself); but the goal is to make the world nicer by adding things. Kilarin wrote: But that is not the only way the Xanadu server is used. It is also seen as a community. Much like a real country. And if a building in a community is abandoned, that property becomes a gap in the economy. This is ALSO a valid point of view. And, in some circumstances, I subscribe to it. There are a lot of players on Xanandu who abuse (really?) the server for building something nice. Comparisons with RL are always a bit tricky. People build houses in order to be protected from the weather, stay warm at night, have a safe place to sleep. Nothing of that is needed in MT. There is no decay, there is no change when there's nobody there. Most of the players are online only for a few hours at max per day. The community exists through interaction of the players (mostly in chat). Kilarin wrote: I'll give you two examples. Suppose there was a gorgeous castle built on a mount top off of a major trail. The builder abandoned it a long time ago, but so what? It's just there to be seen and enjoyed. I see no disadvantage to just leaving the ownership of the castle as is. Errr...yes. That's kind of what I'd take for granted from a reputable server (except for accidents). 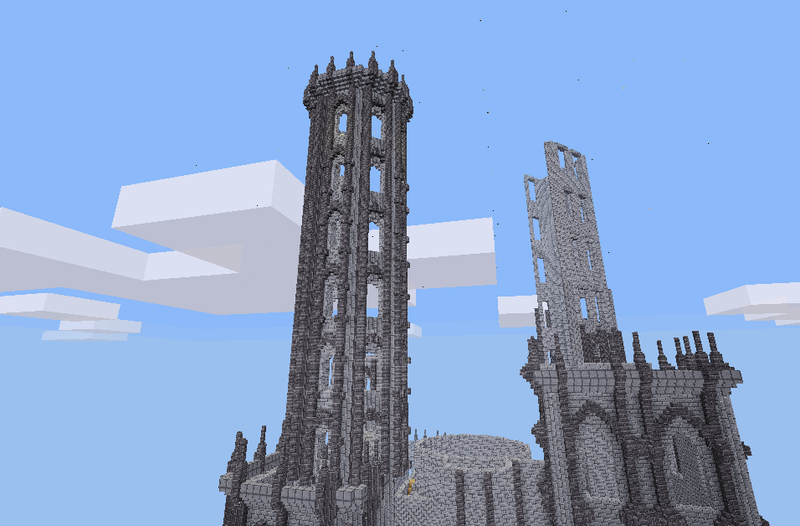 Tearing that fictious castle down would be griefing. Kilarin wrote: BUT, suppose the same builder built a large and beautiful shop right off of main street near spawn. But now, when a new player wanders in, they find the shop is abandoned, there is nothing to buy or sell, and their first impression is that this server isn't very "lived in." It makes perfect sense to me to go ahead and change the ownership on that shop so that someone who is active and will be maintaining it (or even replacing it) can use that important space. That certainly is a valid point. And yet - what keeps Xanandu's staff from just adding the player who's willing to take over as co-owner to the protector blocks? The shops could be removed and new ones placed. It'd even be ok if the owner of the shop nodes would be changed to the new player or to staff members. The new owner could even do some slight modifications where necessary. One thing I'd expect would be a sign inviting visitors to the player's own constructions, right next to a handy teleporter pad. Including one that leads back to the shop from the target location of course. Maintenance may offer far less options for the new player to express him/herself (after all all modifications need to be done as close to what the original builder would most likely have done) and is more work, but that's just so and may be good practice anyway - a way to learn another style perhaps. Kilarin wrote: That's my opinion. But of course, Xanadu is a privately owned server, we are guests, and the owner has the right to distribute property as they wish. The owner has quite a lot of rights, yes. Still, if you want to stick to RL examples: He can't kill his visitors or rob them. Perhaps this forum might be a more suitable example: Imagine if celeron55, the owner of the forum, would take your posting and change the creator from you to somebody else. Would that be ok? Ought that to be ok? Has the host really all rights? Can he i.e. insert something that's illegal into your post so that you'd get sued? On the other hand: Fixing i.e. a broken download link or removing illegal content are also modifications. Yet that'd be what I'd consider maintenance. It's always a violation but might be justified in some situations. auouymous wrote: I and probably many others build just for fun, not for recognition, and building on servers provides motivation to finish and helpful suggestions from others, where as singleplayer doesn't. I'd rather see my builds claimed by someone else than see them slowly decay as new players grief the unclaimed areas or know a server command was used to erase my build from existance. Protection from griefing is essential and doesn't have anything to do with the displayed ownership. You're right about the feedback and suggestions from others. That's very valuable. Still, what keeps the server from just maintaining buildings where the original creator hasn't been seen in a while? auouymous wrote: And many builds you praise the owner for might have been built by more than one player. I've contributed to other player's builds and so have many others. And how many players have built really nice homes and given them to new players as gifts? I hope that in the case of multiple builders they're either added as co-owners (necessary for building together anyway) or i.e. mentionned on a sign. Bonus points if it's a nice RPG-like text :-) Smaller contributions/ideas/hints count as friendly neighbour help and ought to roughly equal each other out. "Selling" a house or giving it to another player as gift doesn't really work. The new owner can never become the original creator. Building something for someone specificly is possible - kind of as a donation. But that doesn't change who did it. The painting you got as a birthday gift may have been painted for you, you may own it - but you're not the creator unless you painted it. You may become the creator of a new, diffrent work of art if you stick your head through it and thow a pot of yoghurt against it - maybe someone would buy that as modern art. The original creator of the painting may or may not approve. auouymous wrote: The world will always be full of liars who take credit for other's work, but if you ask many players who re-claim a build, they'll probably tell you they aren't the original owner. That's very likely, yes. Trouble is: They're humans. They will be more active than the original creator is right now - but they can by no means cover 24/7. So most of the time visitors will get the wrong impression. Regarding my buildings: It'd be a lot of work to tear them down :-(. But the instant someone else is stated as creator/"owner" of the land the informal agreenment with the server ceases to exist. They're not WTFPL - they're CC-by-SA. @Binshaden: Exellent work! Hope you finish it eventually. Yet...from the discussion here I fear that it may in some years "belong" to someone else.